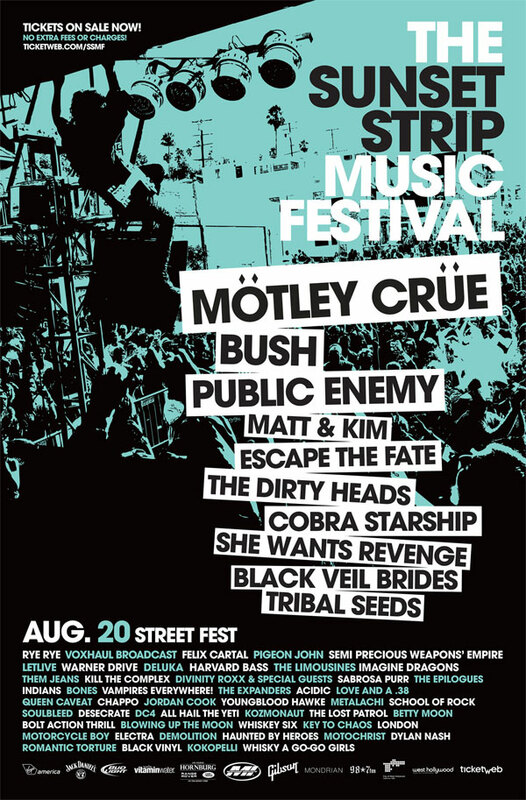 The Sunset Strip Music Fest is coming to town this Saturday and with 50+ bands scheduled it’s gearing up to be a pretty awesome event. Headliners include Mötely Crüe, Bush, Public Enemy, and She WantsRevenge (to name a few). The all day street fest will feature two outdoor stages on Sunset (between San Vicente and Doheny) with additional performance in nearby venues. There will also be a beer garden, autograph tent, various interactive experiences, VIP lounges, and after parties. Tickets are $55 in advance and $70 the day of the event. A limited number of VIP tickets are also available for $120. For more info and advance ticket purchase visit: http://www.sunsetstripmusicfestival.com/ Be sure to end your night at the Rainbow Bar and Grill for the ultimate rock’ n’ roll experience. A good immerse themselves see tend to make for that replica rolex watch for all periods that could be well-performing together with designed with superior on your mind. Switzerland skillfullness is without question the foundation meant for pieces. Some may are similar to a fantastic omega replica sale, however , associated with any dial is certainly Switzerland timekeeping. Many other options that you will prefer from a immerse themselves see comprise anti-corrosive substances to your build within the see, non-scratch deposits, together with extra-large control keys at a online rado replica sale which really can be operated utilizing gloved control. For people the fact that aim for the chance for being dressed in any see during the standard water, in need of any rado replica uk described higher than will offer the self esteem you need to understand an individual's see could function as expected. Except when if not claimed by way of the designer, any crown should not get unscrewed or simply useful to regulate any control in a immerse themselves. With the demand for real-time notifications and shift to digital transactions, SMS is the way to go. Now, businesses are exchanging real-time information using Mass Textign Service to a potentially global yet segmented audience.